- Stock orders are dispatched the same day as receipt up until 6pm. Delivery is usually by courier, priced at a flat rate regardless of quantities. FREE NEX?T DAY carriage to UK mainland is available for all standard sized items on orders over £20.00 exclusive of VAT but can be upgraded to express service at checkout. 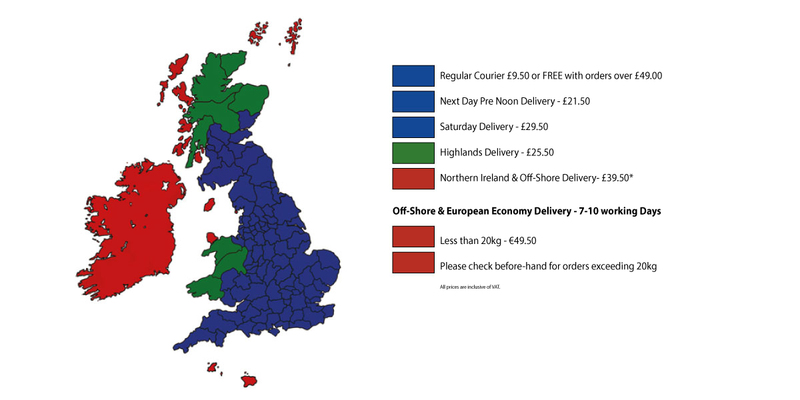 Due to delivery costs & packaging restrictions, items 2m - 2.5m are not covered by free delivery unless exceed 5 in QTY and the entire order is over £150.00 ex VAT. Items over 3m are excluded from FREE DELIVERY. - Any damages, errors or shortages requiring a replacement should be notified within 3 days of receipt of order with evidence by emailing sales@theledstore.co. Replacements can only be sent upon completion of a parcel force claim which may include collecting of the goods AND original packaging, and completion of a parcelforce questionnaire. - Goods damaged in transit can only be replaced if signed for as 'Damaged'. - Goods that are in a resalable condition can be returned for within 14 days of receipt for a refund reduced by any delivery charges. It is the customers responsibility to ensure prompt delivery, and recommended that the relevant proofs and/or insurances are taken prior to returning goods. - We are not responsible for any failed/late deliveries. - Prior to returning any items, customers must ensure to contact us for a 'RETURNS AUTHORISATION NUMBER' & confirmation or returns address. Failure to do so may result in delayed/failure to refund. Please ensure any returns include a complete Returns Authorisation form. DELIVERIES OF OVERSIZED ITEMS SUCH AS 2m/2.5m Lengths & LIGHTING COLUMNS MAY NOT BE ELIGIBLE FOR FREE DELIVERY. OVERSIZED ITEMS SUCH AS LIGHTING COLUMNS ARE BY SPECIAL COURIER AND WILL BE BOOKED IN PRIOR TO DELIVERY - FREE DELIVERY COVERS WALES & MAINLAND ENGLAND - FOR SCOTLAND PLEASE CHECK PRIOR TO DELIVERY. PLEASE NOTE ONCE DELIVERY IS BOOKED IN, ANY UNSUCCESSFUL DELIVERY ATTEMPTS MAY BE SUBJECT TO A RE-DELIVERY CHARGE of £85.00 EX VAT. PLEASE NOTE OVERSIZED ITEMS ARE NON RETURNABLE. Please note - B2B - business to business transactions are EXEMPT from the Consumer Contracts (formerly distance selling) - and hence business customers may be subject to restocking charges. It is the buyers responsibility to pay return delivery fees. By ordering from the LED Store your accepting these conditions. We advise that you do not book in any labour or works before receiving your order in full, couriers will not be held responsible for delayed deliveries.